WE work hard. Each month we get our pay packets. Part of it we bring home, part goes to the Government. We spend our part wisely. We root out the bargains. But what about the share that’s taken by the Government? Are they as smart with our cash? For too long, they haven’t been. And for 13 long years under Labour there wasn’t any real transparency about what was going on. Now we’re doing things differently, publishing all big items of public spending online. It’s like when you go home with a new purchase, and someone asks: “How much?” That is the common sense we apply at home. And that is the common sense that’s finally being applied in government. 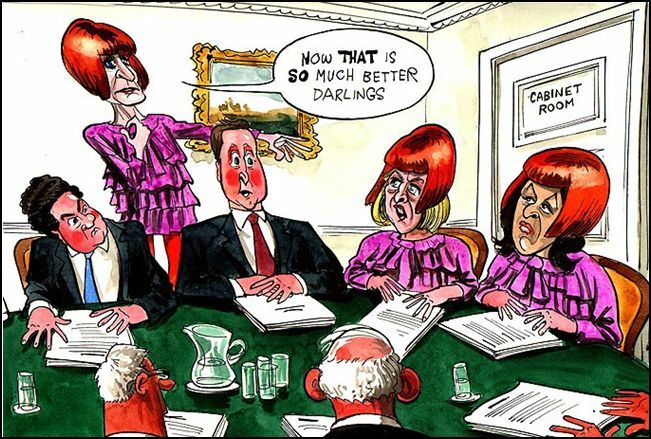 I loved the Sun’s cartoon yesterday of me and Theresa May dressed like Mary Portas. For me, it summed up exactly why her comments about the dress sense of women politicians were so silly. The Sun’s investigation into BNP chief Chris Hurst has confirmed what readers already knew about his party. The BNP’s vile racism is plain for all to see. These shameless fascists have only one objective: to create chaos in our country and destroy harmonious communities. Writing exclusively in The Sun.